G.L. Hills Funeral Home owner Graham Hills provided a $1,000 challenge check to the Des Plaines Rotary Club to encourage others to donate funds for Shelter Boxes to be sent to the Haiti Earthquake Relief Effort. Mr. Hills' donation prompted the club to match the $1,000 and then submitted a District Simplified Grant application for $2000 to District 6440. 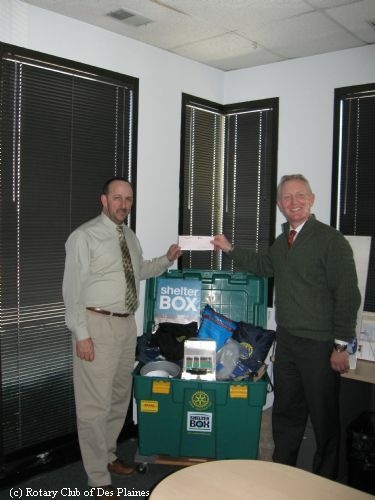 This allowed the Des Plaines Rotary Club to send 4 shelter boxes to Haiti.